We send our congratulations to all of the poets announced as National Endowment for the Arts Creative Writing Fellows today. Among their numbers are several whose works can be heard in PennSound's archives. First, there are Brandon Brown and Eleni Sikelianos, who have PennSound author pages of their own. Brown's features a trio of recordings from the Segue Series, A Voice Box, and the Cy Press reading series, while Sikelianos' page hosts numerous recordings including Segue Series sets from the Ear Inn and the Bowery Poetry Club, interviews with Amy King and Leonard Schwartz (on Cross Cultural Poetics), and a 2011 appearance at our own Kelly Writers House. Major Jackson has two poems from a 1997 episode of "Live at the Writers House" available through our singles database, while Cynthia Hogue has recordings from a variety of sources (including Heatstrings, Cross Cultural Poetics, Convergence on Poetics, and Segue sets at the BPC and Double Happiness. Finally, LaTasha N. Nevada Diggs has recordings available via Segue at the BPC and Cross Cultural Poetics, along with Belladonna*, ADFEMPO, and the Mills College Contemporary Writers Series. Here's a very exciting recording that was just added to PennSound's archives: a recent talk by Jennifer Bartlett on the one and only Larry Eigner. 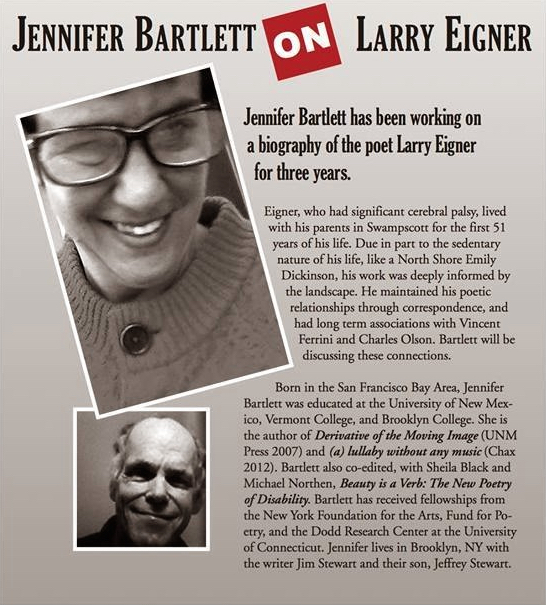 Recorded on November 29th of this year at the Gloucester Writers Center, this seventy-five minute recording is an intimate conversation between the audience and Bartlett was framed as follows on the flyer for the event (shown at left): "Jennifer Bartlett has been working on a biography of the poet Larry Eigner for three years. Eigner, who had significant cerebral palsy, lived with his parents in Swampscott for the first 51 years of his life. Due in part to the sedentary nature of his life, like a North Shore Emily Dickinson, his work was deeply informed by the landscape. He maintained his poetic relationships through correspondence, and had long term associations with Vincent Ferrini and Charles Olson. Bartlett will be discussing these connections." What emerges, largely guided by questions from an engaged audience, is a fascinating portrait of Eigner's life and writing. Bartlett's immersion in the fine details of the poet's life over the course of her years working on his biography is quite evident here, as she quotes chapter and verse from his diverse correspondence with his friends and poetic peers, as well as his publication history. Whether you're a casual reader or a serious fan of Eigner's work you're bound to learn something new from Bartlett's talk. You can hear this discussion, along with a number of rare recordings from the 70s through to his last public reading in 1995 on PennSound's Larry Eigner author page. We'd like to send birthday greetings out to Eileen Myles, a true American original, who turns sixty-five today. You can celebrate by browsing through the selections available on PennSound's Eileen Myles author page,. A good place to start is her two-part 2009 Close Listening radio program with Charles Bernstein that includes readings of twenty-one poems from throughout her published work, and a half-hour conversation between the two. Other full-length readings include a number of sets from a busy 2010 recorded at the Dia Art Foundation, Mills College's Contemporary Writers Series, the ICA in Philadelphia, our own Kelly Writers House, the Bowery Poetry Club, and the California College of the Arts. Two recordings from 2009, taken from the Poetry Center at the University of Arizona (via POG Sound) and ADFEMPO, are followed by a 2007 appearance on LA Lit, a Belladonna* series reading from 2003, a 1981 reading at the St. Mark's Poetry Project, and a 1978 appearance on Susan Howe's WBAI-FM radio program. Other recordings include Segue Series sets from 1978, 1994, 1998, 1999, and 2007, and three appearances on Public Access Poetry, not to mention numerous individual tracks scattered over the past thirty-seven years. This week brought news of the passing of Jane Freilicher, hailed by the New York Times as "a stubbornly independent painter whose brushy, light-saturated still lifes and luminous landscapes set in the marshes of eastern Long Island made her one of the more anomalous figures to emerge from the second generation of Abstract Expressionists." Of course, Freilicher was also a close compatriot of many members of the New York School poets, and for this reason she makes more than one appearance in PennSound's archives. The more conventional of these is available on John Ashbery's author page: a January 2011 program at the New School honoring the 60th anniversary of the Tibor de Nagy Gallery. Ashbery appeared alongside Andrew Lampert, Bill Berkson, Ron Padgett, Douglas Crase, and Eric Brown. 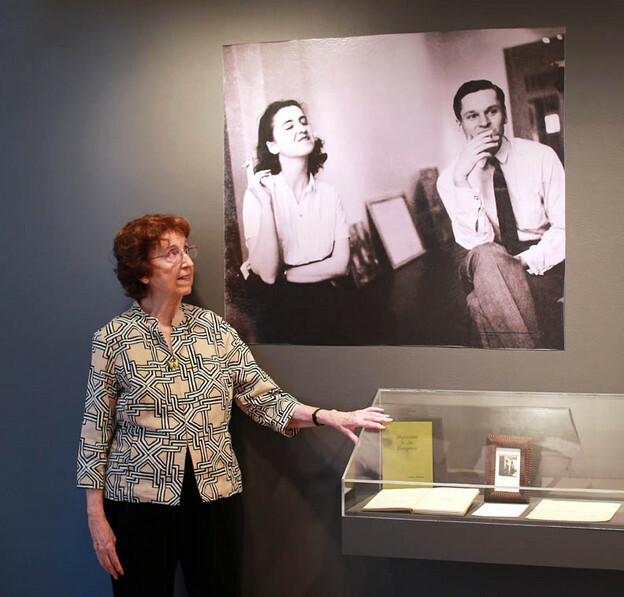 In this fifteen-minute segment, moderated by Jenni Quilter, Freilicher details how she first met Ashbery, Ashbery discusses his work as an art critic and Freilicher's influence on his poetry, and both share memories of the Tibor de Nagy Gallery. Their conversation also touches upon Rudy Burckhardt's film, Mounting Tension in which both had starring roles. While that film isn't available on PennSound, you can watch The Automotive Story (1954), for which Freilicher serves as narrator of a text written by Kenneth Koch while Frank O'Hara plays Debussy, Poulenc, and Scriabin as accompaniment on our Rudy Burckhardt author page, where you'll also find a link to a transcription of a 1976 radio interview with the director about the film, originally published in Jacket Magazine. The end of the semester and the transition into the holiday break usually means that we'll get a new batch of Cross Cultural Poetics programs from host Leonard Schwartz, and this year's have just arrived. Altogether, we have a half-dozen new shows that were broadcast this past fall, as detailed below. First up is episode #302, "Seattle Opera/Apples from Tolstoy's Garden," which starts with an interview with Jonathan Dean, Seattle Opera's Director of Public programs and Media, who talks about their production of Mozart's Don Giovanni. He's followed by Galician poet Yolanda Castano, calling in from Spain, who reads her poem "Apples From Tolstoy's Garden." 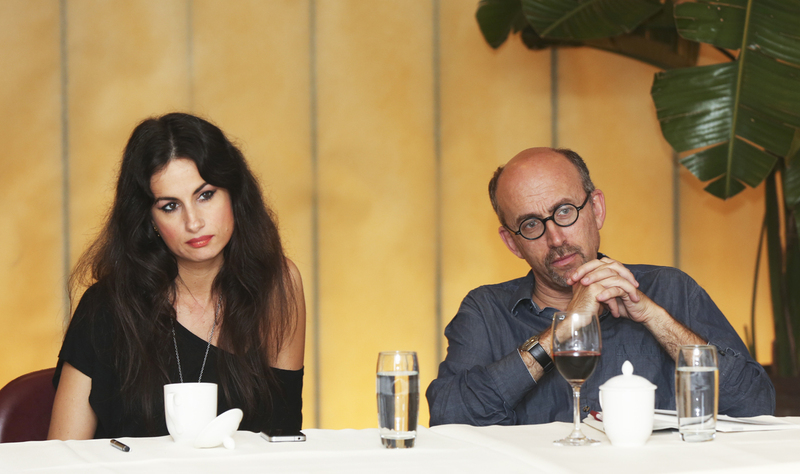 Castano (shown at left with Schwartz at the Beijing Poetry Festival this past September) returns for episode #303 to read and discuss her own poetry, in Galician, as well as to talk about the history, properties and circumstances of the Galician language; she also reads the medieval Galician troubadour Mendhino. Episode #304, "Nimrod/el-Sousi," is named for its two guests: first Nimrod, the multifaceted Chadian author, who calls in from Paris, to read his poetry, who's followed by Palestinian poet, Somayo el-Sousi, on the phone from Gaza City, who reads two new poem-essays written while under Israeli bombardment in the summer of 2014. That's followed by episode #305 "Red Flash on a Black Field," which focuses on the work of Joseph Donahue, reading from his latest book of the same name. The fall season wraps up with episode #306 "From Zagreb," featuring poet Marko Pogacar, who reads from and discusses his own poetry, as well as Croatian language, followed by episode #307 "From Shanghai," in which Yan Li, a Chinese poet and painter, reads from his new book Talent Possibility, translated by Denis Mair. 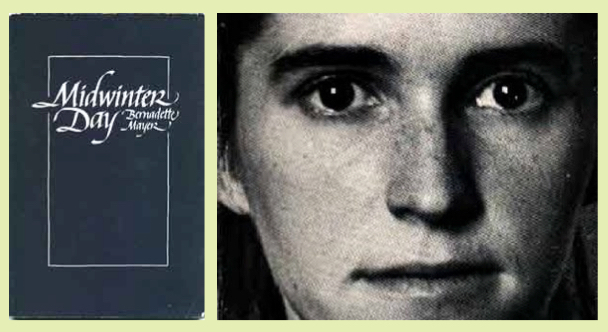 With the winter solstice and what may (or may not) be the longest night ever it's a good time to get reacquainted with Bernadette Mayer's classic long poem, Midwinter Day, written in its entirety on this day in 1978 at 100 Main Street in Lennox, Massachusetts. As Megan Burns notes in her Jacket Magazine essay on the book, : "A long held tradition on Midwinter's Day was to let the hearth fire burn all night, literally keeping a light alive through the longest night of winter as a source of both heat and a symbol of inspiration to come out the other side of the long night closer to spring and rebirth. It is fitting that a poem about surviving death and the intimacy of the family would be centered around this particular day that traditionally has focused on both. The hearth is the center of the home where the family gathers, where the food is cooked and where warmth is provided. Metaphorically, the poem Midwinter Day stands in for the hearth gathering the family into its folds, detailing the preparation of food and sleep and taking care of the family's memories and dreams." Mayer read a lengthy excerpt from the book at a Segue Series reading at the Ear Inn on May 26th of the following year, which you can listen to on her PennSound author page along with a wide array of audio and video recordings from the late 1960s up through this past fall. PoemTalk 83: on Wallace Stevens' "The Poem That Took the Place of a Mountain"
We're closing out the year with one last program from the PoemTalk Podcast series (its eighty-third altogether), which addresses Wallace Stevens' poem, "The Poem That Took the Place of a Mountain." For this episode, host Al Filreis was joined by Susan Howe, Dee Morris, and Nancy Kuhl (shown left-to-right at left). Filreis begins his post on the PoemTalk blog with some background information on the poem: "Among the last things Wallace Stevens wrote was a metapoem, a poem in which a man — a reader and presumably a poet too — does not write a poem but picks his way among the aspects of an old poem, the poem that had once helped him by standing in for a mountain. He composes (or rather 'recompose[s]') the objects and perspectives of the way or path up the mountain. It had been a 'direction.' Was it now again? This late effort is called 'The Poem That Took the Place of a Mountain,' and it was published with other new poems in a section of Collected Poems (1954) under the heading 'The Rock.'" You can read the rest of his introduction on Jacket2. PoemTalk is a co-production of PennSound, the Kelly Writers House, Jacket2 and the Poetry Founddation. If you're interested in more information on the series or want to hear our archives of previous episodes, please visit the PoemTalk blog, and don't forget that you can subscribe to the series through the iTunes music store.